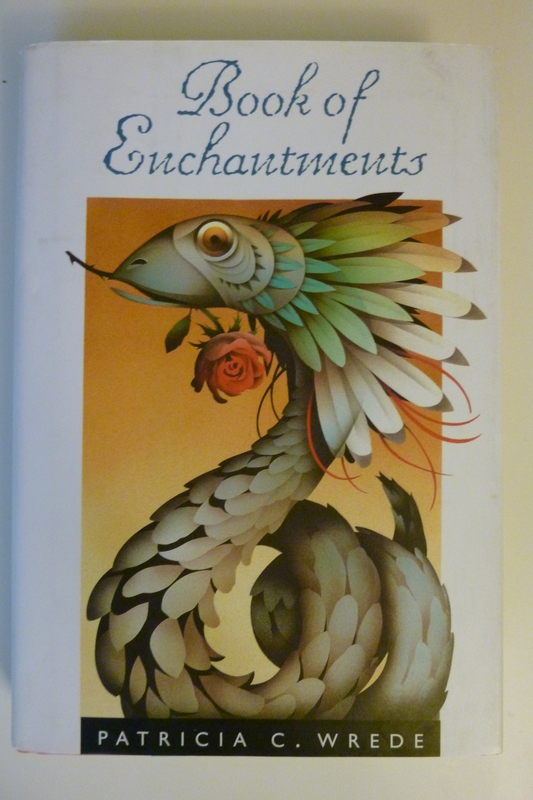 You may know that I’m a big fan of Patricia C. Wrede’s Enchanted Forest Chronicles. I just recently bought another of her books–Book of Enchantments. It’s a collection of short stories, and I’ve lost track of how many times I’ve read the library’s copy. When it arrived in my mailbox, I went down the Table Contents. I could vividly remember all but two stories, matching my memories to the titles–and I’m usually not good at remembering things like titles, especially when I haven’t read the book in probably a couple of years. It’s a wonderful collection of stories. They all deal with magic, but they vary widely in subject, setting and tone. Some are funny; some are eerie; some are haunting. And obviously, they’re memorable. “Rikiki and the Wizard” has a fable-like quality to it, about Rikiki the blue chipmunk god, who’s obsessed with nuts (as a chipmunk naturally would be!) “The Lorelei” combines a perfectly ordinary, modern student bus trip with the dangerous power of a siren. “Cruel Sisters” and “Stronger than Time” both reimagine old fairy tales, bringing darkness but also more human characters. Two of the stories are related to the Enchanted Forest Chronicles. One, “Utensile Strength,” actually features major characters from the series, which is delightful simply in itself. Combine familiar characters with a magical weapon called the Frying Pan of Doom, and I really don’t know how you could go wrong. “The Princess, the Cat and the Unicorn” is less directly tied into the series, but it makes up for it by being amusing and lovely and a bit romantic. It’s set in a magical kingdom where nothing goes quite right: “The magic carpet had a bad case of moths and the King’s prized seven-league boots only went five-and-a-half leagues at a step (six leagues, with a good tailwind).” It has all the charm of the Enchanted Forest Chronicles, gently poking fun at how fairy tales are supposed to be. Two of my favorites (aside from the two above) are very different from each other. “The Sixty-Two Curses of Caliph Arenschadd” is about a caliph who works his way through a list of curses whenever anyone displeases him. Most of the curses are funny, like turning people green or giving them monkey paws. The story centers on the daughter of the Caliph’s grand vizier, who has to figure out a way around the worst curse of all. “Roses by Moonlight” is set in the present day. Adrian, a teenager, is unhappy with her life, jealous and resentful of her perfect younger sister Samantha. One night a mysterious woman invites her for a walk in the garden, and Adrian finds herself in a rose garden she never saw before. Adrian realizes that each rose she smells gives her a vision of a different future. The woman tells her that she may pick one rose… There’s something haunting about the idea of a garden of possibilities, letting you see all that could be, and then giving you the chance to choose your life by reaching out and plucking a flower. But obviously they’ve all stuck with me to a greater or lesser extent. Try the book–maybe they’ll stick with you! I love when I actually have a book I want to read lying around…so convenient! Enchanting is the PERFECT word for them! I will have to check this out. I’ve always loved the Enchanted Forest Chronicles but I’ve never read anything else by Patricia C. Wrede. For a long time, this was the only other book I had read by her. I’ve been trying to read more lately–but this is probably still my favorite non-Enchanted Forest one!